When we moved into our new house one of the things we loved about it was the extended garage. We couldn’t wait until we could get our workshop set up in it. To do that, we wanted a large work bench that we could move around where needed. 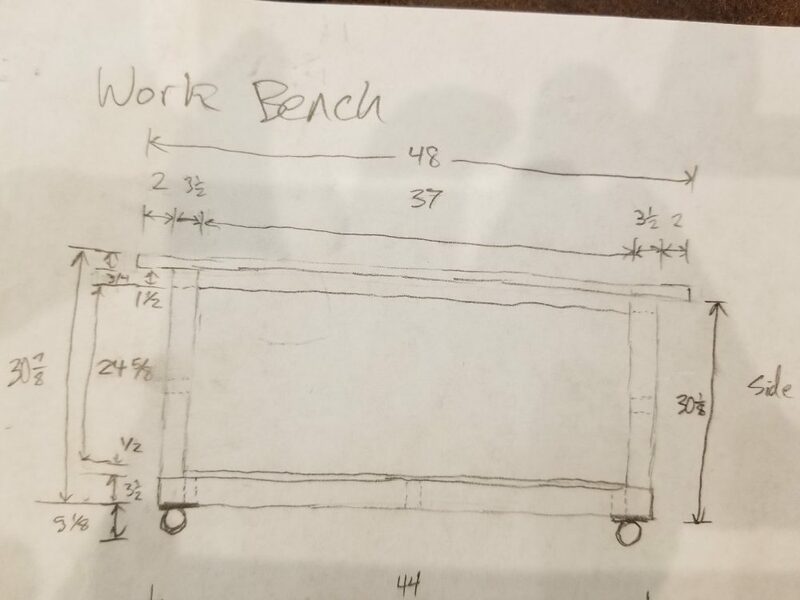 We also wanted a work bench that could be extended for a large project. That’s how we came up with this work bench! 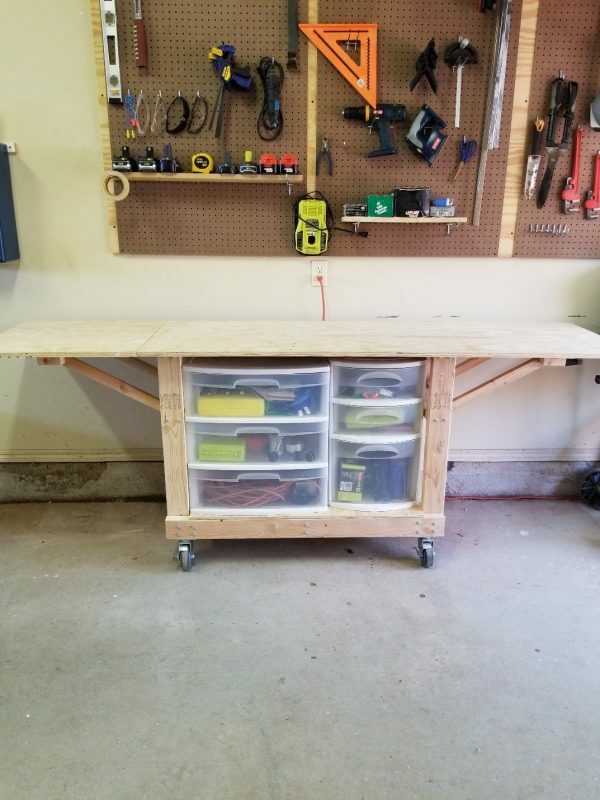 Our work bench is the same height as a Ryobi table saw so it’s helpful when ripping large items. Making the main body and top of the work bench was relatively easy but adding the extendable wings was more complicated, so if you want to not add the wings that is fine too! First you need to cut all your boards to the correct size. On the 1st 2 x 4 cut two boards each 44 inches long. On the 2nd 2 x 4 cut three boards each 30 1/8 inches long. On the 3rd 2 x 4 cut one board 30 1/8 inches, cut one board 17 inches and cut three boards 14 inches long. Cut one piece of ¾ inch plywood, 48 inches by 24 inches then cut two pieces from the ¾ plywood 24 inches by 24 inches. Here are some drawings of the sides, bottom and top frame. 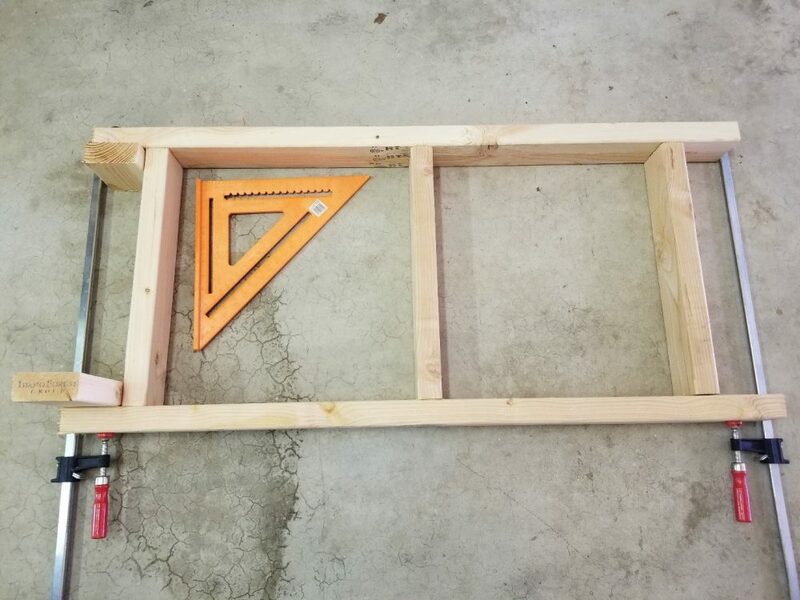 Now to make the top frame: Place the 48 in x 24 in board on the ground. Using the 2 inch wood screws, attach one of the 14 inch 2 x 4 boards centered at one end of the board, leaving a 2 inch overhang. Then place the 38 inch 2 x 4 centered to the first 14 inch. Next put another 14 inch on the other end of the 38 inch board. See how it will look in the picture below. Now it’s time to attach the legs for the work bench. Use the four 30 1/8 inch boards as the legs of the bench. Place them at the end of each 44 inch board on the bottom frame besides the 17 inch board. Then screw them into place. Between the two legs on the short side, place one of the 14 inch boards and screw them to each leg. The bottom of the 14 inch board should be 18 ¾ inches above the bottom of the 30 1/8 inch boards. Place the top to the frame you just built. 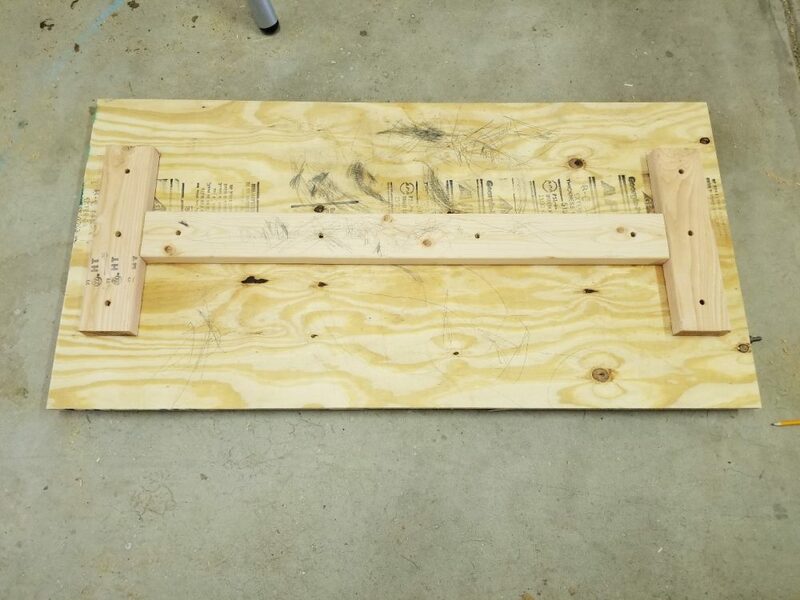 The legs should align with the 14 inch boards on the top frame. We placed some weights on the top so make sure it was level and didn’t bow. Then using the lag screws attach the legs to the top frame. Now flip over the bench and put the top on the ground. Attach the wheels to all four legs by using the roofing screws. Now to make the expandable wings on either end of the table. 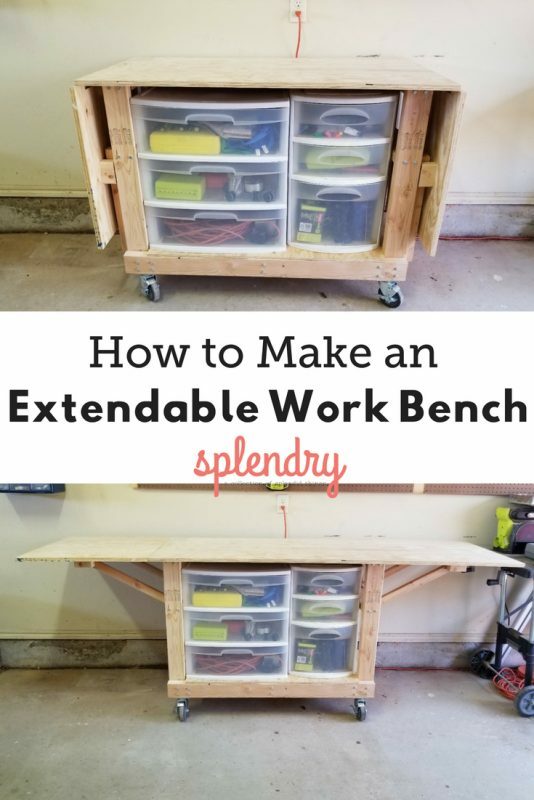 Take the two 24 x 24 inch plywood squares and place on either side of the work bench. Then using a spare 2 x 4 (or some other straight board) position the extension board in the extended position with clamps. Using the large hinges (2 ½ x 1 ¾ inch hinge), screw two hinges to the bottom side of each board. Now using a 2 x 2 or cutting a 2 x 4 in half, cut four 18 inch boards. Drill a hole at the end of each 18 inch board about ¾ inch from the top. This is where the screw eye will go. Screw the screw eye through the hole you just drilled. You want to screw it in about 0.16 inch through the hole so it will make an indention on the wood block it will attach too and you can know where to drill on your attachment block. Attach each 2 x 2 using a small hinge (1 in x 1 inch hinge) to the middle brace between the two legs. Cut four blocks from the 2 x 4 leftovers about 2 inches tall. These blocks will be attached to the extendable wings and is what the screw eyes will screw in too. With the wing extended and the 2 x 2 extended to touch the wing, place the 2 x 4 block on the bottom of the wing such that the screw eye lands about in the middle of the block. Push the block into the screw eye hard enough to make an indention. Drill a hole in the block where the indention is, screw the screw eye into the block, and then attach the block to the wing of the work bench using wood screws. Repeat the same process on the other side and you are done! We love how our new work bench turned out! I love that it doesn’t take up much space but can be extended to up to 8 ft if we have a large project we are working on. 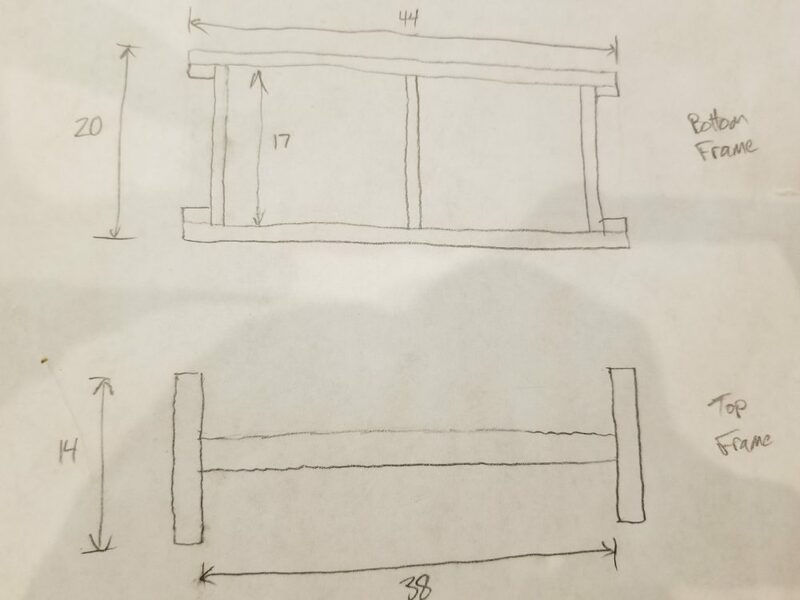 Let me know if you have any questions or if you are going to build this work bench for your own shop!